Product #6453 | SKU SES-TR-153 | 0.0 (no ratings yet) Thanks for your rating! 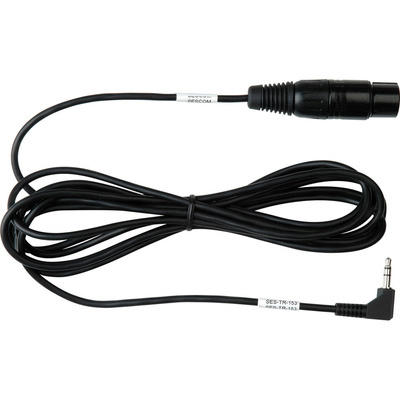 The Sescom SES-TR-153 XLR to Right Angled Mini Microphone Cable is used to connect standard XLR terminated microphones to compatible DSLR cameras (see compatibility chart below). The cable features a standard XLR female input and a right-angled 1/8" (3.5mm) mini male output connection. Low to high impedance matching "steps up" the microphone level, and its RFI shielding eliminates noise from cellphones, PDA's, WIFI and more.